All of the presentations were interesting, vibrant and thoughtful. Some of the fellows provided deep insight into challenging social issues. 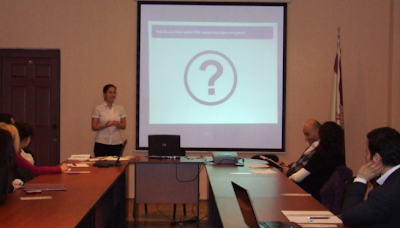 The fellowship selection committee, represented by Leyla Karimli, Sabina Rustamova, Tamerlan Rajabov and CRRC program staff had a difficult time selecting the contest winners. Topical clarity, use of CB data, coherent information and presentation skills were all considered by the committee. The winners of the best three presentations were Aynur Ramazanova, Shahla Mammadova and Nargiz Mammadova. 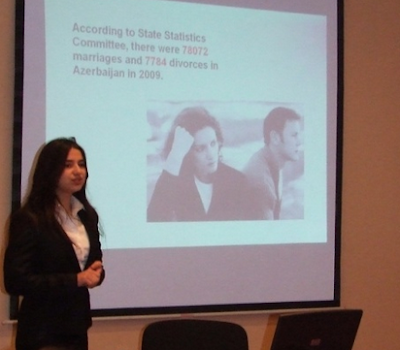 Aynur Ramazanova examined the experiences of divorced women in Azerbaijan and showed that they are more likely than married women to experience feelings such as loneliness, emptiness and rejection. Shahla Mammadova also dealt with psychological issues arguing that people with a stronger psychological state are more likely to rate their health as ‘good’, get up early in the morning, have a job and generate more income. 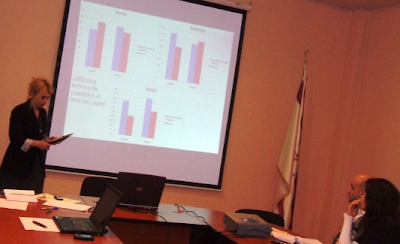 Nargiz Mammadova compared levels of trust and corruption in Georgia, Armenia and Azerbaijan. The winners of the competition received external hard drives. The other presenters received USB flash drives as recognition gifts. Please see some photos from the presentations below!